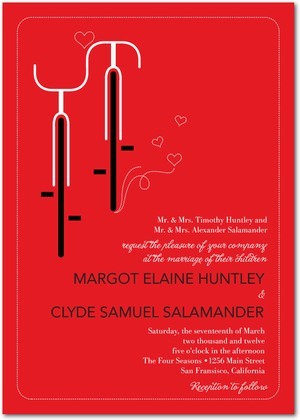 These sweet wedding invitations feature mid-century style bicycle illustrations by Eleanor Grosch and would be a great choice for a wonderfully whimsical and fun wedding celebration. Coordinating save the date cards and other paper pieces are available. Colors include Tomato (shown), Paradise, and Gunmetal.